It's Agatha Christie week here at Mystery Playground and around the world. Today we're featuring one of my favorite episodes of Dr. Who - The Unicorn and the Wasp. 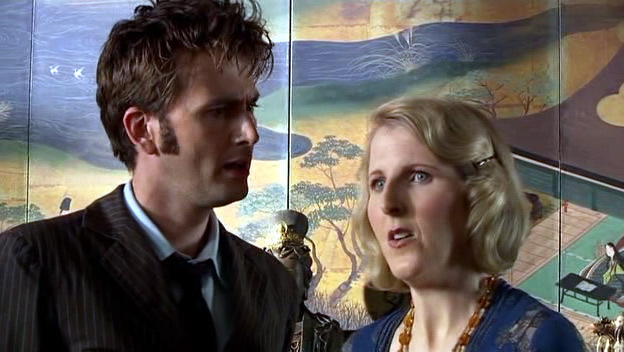 Why are we talking about Dr. Who during Agatha Christie week? Well, the good Doctor gets do everything cool, and what could be more fun than traveling back in time to meet Dame Agatha herself. Of course you can't meet Agatha Christie without being embroiled in a murder that must be solved during a weekend party at an English Manor. 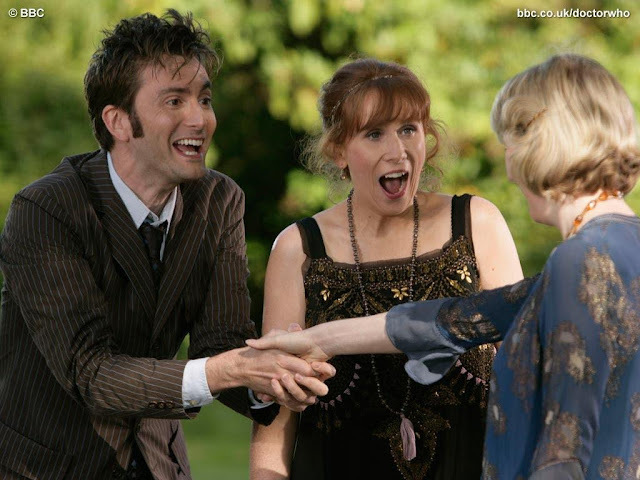 Donna Noble (played by comedian Catherine Tate) is traveling with the Doctor (David Tennant) and they have to use the psychic paper to crash the party to meet Agatha. They discover that this is the exact date that Agatha Christie disappeared. It's not long before Professor Peach is murdered in the library with the lead pipe. Throughout this episode, several of the characters manage to work in titles of Agatha's books in their dialog. It's wonderful. Agatha Christie is played here by Fenella Woolgar. Fenella played the role of Miss Whittiker in The BBC/PBS MYSTERY! production Poirot, in Lord Edgeware Dies and Hallowe'en Party episodes. "She's the plucky young girl who helps me out." - the Doctor referring to Donna. She's not too happy about this. Her response is, "I'll pluck you in a minute." "There's a murder a mystery and Agatha Christie. It's not like Agatha Christie spent her life surrounded by murder, not really. That's like saying Dickens spent his life around ghosts... at Christmas." "I think I've understood some of those words, enough to understand that you are completely potty," Agatha Christie to the Doctor. I don't want to tell you any more because you should just go back and watch it yourself. In fact, you should watch all of the Dr. Who episodes, starting at the very beginning. But just know that when you get to the tenth doctor, David Tennant (Broadchurch & Gracepoint), you've found the best.